Eighty years have passed since Dr. Seuss produced what he called his “Collection of Unorthodox Taxidermy,” an amazing menagerie of Seussian animals often constructed from real animal beaks, antlers, horns, lions teeth, rabbit ears, and turtle shells. The exhibition highlights Dr. Seuss’s little-known sculptural legacy and spotlights the fascinating correlations between his two-dimensional artworks and three-dimensional sculpture. Theodor Seuss Geisel’s unique artistic vision emerges as the golden thread linking each facet of his varied career. The Art of Dr. Seuss ─ A Retrospective and International Touring Exhibition celebrates not only the art and life of Theodor Seuss Geisel, but also chronicles the common artistic links found throughout Dr. Seuss’s nearly 70 years of creativity. This exhibition explores known and unknown facets of Ted Geisel’s life including careers as an editorial cartoonist, advertiser, military propagandist, children’s book author, poet, sculptor, and influential artist. Visitors chronologically walk through Dr. Seuss’s life as they weave through thirty-two didactic panels, intermingled with a mind-altering collection of estate-authorized artworks adapted and reproduced from Dr. Seuss’s original paintings, drawings, and sculpture. Works in the exhibition include both original materials and imagery re-created from significant public and private collections, including the University of California San Diego archives, the Lyndon Baines Johnson Presidential Library, and the Dr. Seuss Estate, and feature rare and never-before-seen images from the 1920s to the 1990s. 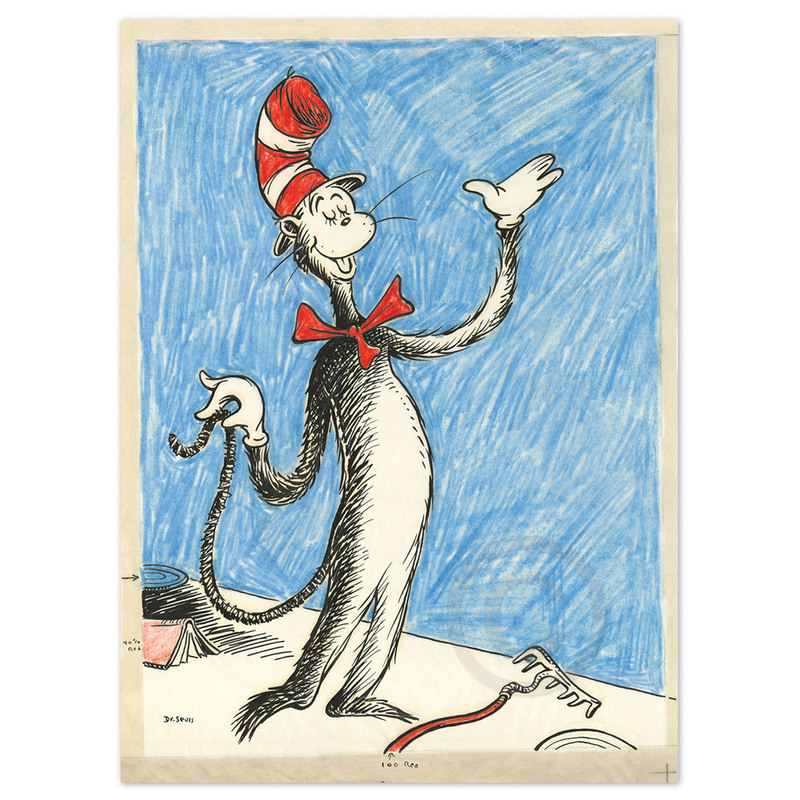 “The Art of Dr. Seuss – Rare Editions Event” presents an extraordinary overview of the artistic legacy of Theodor Seuss Geisel with twenty-four of the most sought-after (and now sold-out) artworks from the collection. This exhibit provides a unique opportunity for visitors to view, experience, and collect from one of the largest selections of authorized estate editions ever assembled. It also provides an insider’s view of the full range of imagery reproduced from Dr. Seuss’s private collection of paintings and sculptures created throughout his 70 years of artistic innovation. Twenty-five years have passed since Dr. Seuss's final words to us were published. His last book - with its powerful images - is truly the capstone of his career. This exhibition artistically highlights the scores of places and eras Dr. Seuss takes us with his incomparable collection of artwork. One of the hats featured in the Hats Off to Dr. Seuss Exhibition. Made by Stanbury Co., Kansas City, of leather, plastic, metal and white fake fur. A gift from San Diego State University in 1986. Ted was chosen honorary chairman of the Holiday Bowl football game between the Iowa Hawkeyes and the San Diego State Aztecs. This touring exhibition marks the first time Dr. Seuss’s hat collection was shown to the general public. Few authors are better known than Theodor Seuss Geisel, a.k.a. Dr. Seuss, yet, to this day, his Secret Art and his fantastical Hat Collection are virtually unknown to the public. Throughout his lifetime, Ted Geisel created paintings and collected hats which he secreted away in a hidden closet at the Dr. Seuss Estate. Traveling in a specially retrofitted old-fashioned steamer trunk, this exhibition launched at the New York Public Library in 2013 and stopped at select galleries and public spaces throughout 2015. The Lorax large-scale bronze installed at the inaugural exhibition of the Bronze Tribute Collection at The Hotel del Coronado in La Jolla, CA. Dr. Seuss’s influence on the 20th and 21st century American art scene was profound, with many of today’s most well-known artists citing him as a key influence in their own artistic development. To celebrate his artistic legacy, a dynamic new sculpture project was announced on the eve of The Cat in the Hat’s 50th birthday. The project includes a series of maquette and large-scale sculptures commissioned for this milestone and as an ongoing tribute to Dr. Seuss. Artist Leo Rijn was selected to be the inaugural sculptor for this project due to his prized work with some of today’s top talent in the world of film, entertainment and the visual arts. A dynamic interaction between corporate and community leaders, local art galleries, individual collectors and city officials, makes it possible for large-scale sculptures to take up prominent residence in communities around the world. These works represent the merging of art and community, while reflecting the spirit of Dr. Seuss’s characters, messages and books.